Vale Do Lobo holidays take you to a modern holiday village with superb golf and tennis facilities, on Portugal's sunny Algarve coast. Located close to Faro and Almancil, holidays to Vale Do Lobo can be taken at any time of year as the summers are long and hot and the winter mild. Although the months of April to October are the busiest, with temperatures rising from mid-twenties to low thirties at the height of the season, the winter months are very popular with golfers wishing to escape from the dark, dreary days of home. 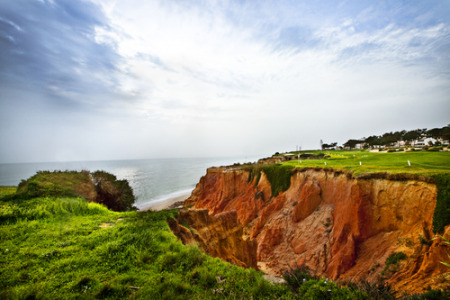 Holidays in Vale Do Lobo appeals to families and couples, and those with an interest in golf and tennis. With a long stretch of sandy beach, it is no surprise that our cheap Vale Do Lobo holidays are snapped up by families with young children. The upmarket villas and apartments offer great value. The village is self-contained with restaurants, shops and a health spa on site. The boutiques are rather exclusive so don't expect any bargains. Nightlife here is low-key reflecting the resort's popularity with families and couples. An auditorium provides cultural entertainment. The village caters for all your needs, so our low cost Vale Do Lobo holidays are sure to please. Since the resort covers a wide area, a shuttle bus is available to transport you to the various activities. If you are looking for a guarantee of sunshine in a delightful area, with some of the best sporting opportunities in the region, our bargain Vale Do Lobo holidays may be just the ticket. For further details and to discover our last minute Vale Do Lobo holidays, please use the search facility.